Zlatan Ibrahimovic will leave Paris St-Germain at the end of the season. The 34-year-old Sweden striker's contract with the French champions expires in the summer, and he has been linked with Manchester United, Los Angeles Galaxy and AC Milan. "I am very proud," he said. "I came like a king, I leave like a legend but I will be back." 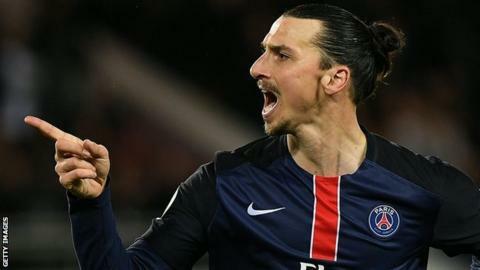 PSG said Ibrahimovic leaves as "the greatest striker and one of the very best players in the club's history". Ibrahimovic is the club's record goalscorer despite only joining the club in 2012, his 152 goals coming in 178 appearances. PSG have won Ligue 1 in every season Ibrahimovic has been at the club, wrapping up the title this season with two months to spare. "I loved every day I spent here," said Ibrahimovic, who has won league titles with six different clubs. "Paris St-Germain has become a star club in the world and I played a key role moving it forward. It is now the right time for me to take a different path." PSG host Nantes in Ligue 1 on Saturday before meeting Marseille in the French Cup final on 21 May. An agreement is in place for Ibrahimovic to return to the club at the end of his playing career, with PSG president Nasser Al-Khelaifi saying he is "looking forward to the prospect of working with him again". Ibrahimovic finished as top scorer in France in 2012-13 and 2013-14, and leads Lyon's Alexandre Lacazette by 15 goals this season. He has also been included in the Ligue 1 team of the year in all of his four seasons in France.